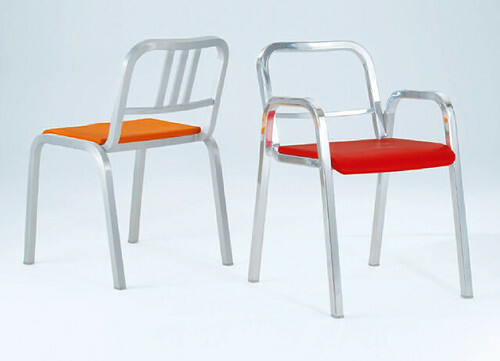 Emeco, unveiled the “Nine-0”, a new collection of chairs and stools by the Italian designer Ettore Sottsass on 16 April, at the 2008 Salone Internazionale del Mobile. I love how the arms on the armchair are formed by the extension of the leg piece. A simple, elegant solution. 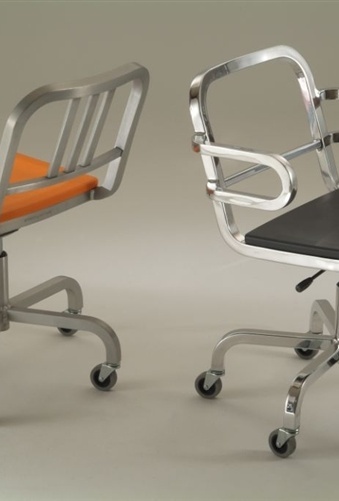 Three versions of the chair/stool are available. (From left to right) 3-Bar Back (shown without arms), Open Back, and Soft Back. “A chair must be really important as an object, because my mother always told me to offer my chair to a lady,” Mr. Sottsass told the Cooper-Hewitt National Design Museum in 1976. Ettore Sottsass was born in 1917 in Innsbruck. Like his father, Mr. Sottsass studied architecture. He served in the Italian army, and after the war, established a practice in Turin, designing interiors, and domestic objects. He later moved to Milan as Italy embarked on post war reconstruction and collaborated with his father on social housing projects, as well as designing small craftsman-made domestic objects. Mr. Sottsass spent a brief period in America, working for George Nelson, which gave his work a transatlantic dimension unusual in Italy. In 1981, he helped establish the Memphis movement with a group of like minded designers who questioned the comfortable definitions of contemporary design. Memphis represented the most coherent attempt to apply post modernism to design. It created an alternative to the aesthetic of functionalism by exploring the emotional potential of design. At the same time that Memphis exploded, Mr. Sottsass’ partnership, Sottsass Associati expanded rapidly to become Italy’s best-known design consultancy, working in architecture, graphics, interiors, products, and furniture all around the world. 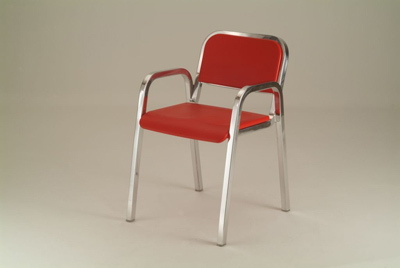 These are the last chairs designed by Mr. Sottsass, who died on December 31, 2007 at the age of 90. Seats: Integrally-coloured, soft polyurethane seat and back. Colours available: green, blue, yellow, orange, red, and grey. This entry was posted on Sunday, 27 April 2008 at 12:00 pm and is filed under chairs, Furniture. You can follow any responses to this entry through the RSS 2.0 feed. You can leave a response, or trackback from your own site.